Tom Dixon’s Comet Lamp, in collaboration with Veuve Clicquot at Art Stage. Click on the image to see more photographs. 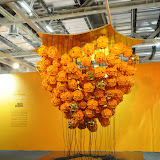 Art Stage is by far the largest Art Fair Singapore has ever seen, trumping Affordable Art Fair (2010), Art Singapore (2000 – ), Tresors Art Fair ( 1993-2002). Art Stage serves a larger purpose and national agenda then simply complementing Singapore’s cultural calendar. Art Stage offers a wide repertoire of international contemporary artworks (and artists) which range from blue chip Picasso to contemporary China-powered, monumental Ai Weiwei. There are 2 aspects of the exhibition worth discussing here: the economic value of art and ‘internationalisation of the art scene’ through an art fair as opposed to sponsoring Singapore artists at an international art exhibition such as Documenta or Venice Biennale. Firstly, it couldn’t have a better match of venue to an event puts monetary value on art when it’s held at the Marina Bay Sands Integrated Resort. One of two casino-based developments, the Integrated Resort has created jobs, attract investments, and propelling Singapore’s speedy recovery from the economic downturn. Similar to the IT fair that displays cutting edge technology and sell IT stuff, the Art fair showed latest art and sold art. The concept of art having a monetary value may be alien to some, especially if the artwork is challenging to the aesthetic senses, space and time. Take Ai Weiwei’s Through for instance, towering 5.5m and occupying 115 square metres. Conceptually, his work questions the value system and hierarchies of power in China, but to some, the installation is a misplaced pile of oddly arranged discarded wood. In a Gordon Matta-Clark reconstructive manner, these reconstituted antique furniture, beams and pillars from the Qing dynasty also questions the definition of sculpture and space. Unless you are a private collector or museum of substantial means with an acquired taste, a large exhibition hall or warehouse to store, the thought of buying it would never cross your mind. To explain the economic value of art involves an understanding of buying ‘services’ and ‘products’. Art isn’t quite entertainment, but some would compare art to a luxury good. Prospecting or speculating art aside, Art lies between a service and a product – it yields intangible satisfaction similar to those from the luxury service industry and thus commands a high price; it is a unique object that commands design, material and labour costs. In simple terms, people are willing to pay good money for good art, because they derive pleasure from looking at or owning art. Secondly, ‘internationalisation of the art scene’ could mean different things. It might mean educating the Singapore audience by bringing an international cast of artists and artworks of different sensibilities and aesthetics. It might mean showing the world what Singapore art is, through an international art fair frequented by who’s who in the global art world. Arguably, Art Stage could be seen as a fragmented exhibition, subsidized by the art galleries. Despite the S$30 entrance charge for adults, S$10 for students, it does succeed to round up many interesting artworks which would not normally be shown locally. On boosting the exposure of Singapore art, much remains to be desired. We can’t brand Singapore Art without knowing what it is, without resolving issues of identity and hybrid culture. In addition, artists need to reexamine the art they make and reflect on two issues: craftsmanship and concept. Only when one’s position in an internationalised art scene is considered, and affirmation given by local collectors or supporters, can Singapore Artists make their real debut on the Art Stage. “Art Stage is supported by the Economic Development Board (EDB), Singapore Tourism Board, National Heritage Board and the National Arts Council. The budget remains undisclosed.” Deepika Shetty, Stage Set for Premium Art Show, The Straits Times, Jan 13, 2011.